Join Us For Our Annual Real Estate Forum! Landfall Realty will hold its annual Real Estate Forum hosted by General Manager, Ken Kirkman, on Tuesday, February 27 at 5:30 at the Country Club of Landfall. All property owners and club members are welcome to attend. Beer, wine and cheese will be provided by Landfall Realty and John Szalay of CresCom Bank. 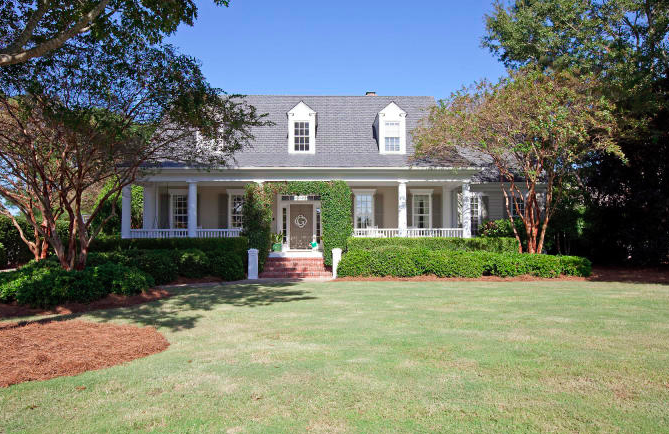 Located on one of Landfall’s most sought after streets, this low country home features 4,455 square feet on an almost ½ acre Jack Nicklaus golf course lot. 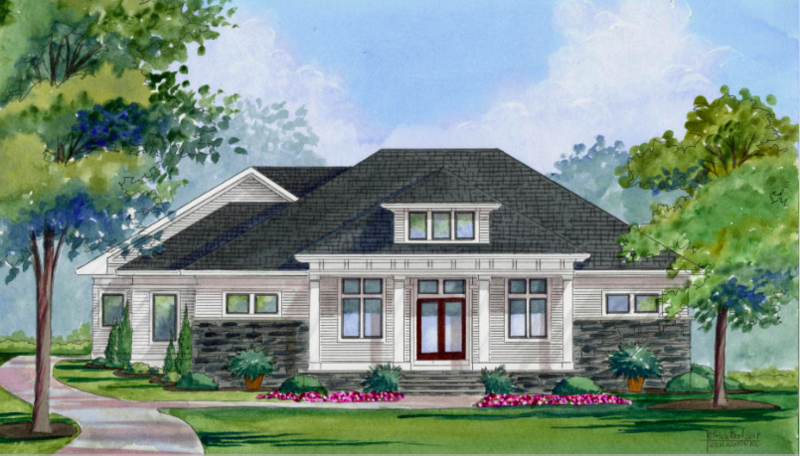 A broad front porch welcomes you into the foyer flanked by a private study and dining room. Just behind the foyer is the main living room with a 2-story ceiling and a fireplace. The living room unfolds into a sunny, eat-in kitchen with a center island, updated appliances, and quartz counter tops. Adjoining the kitchen is a built in desk area. 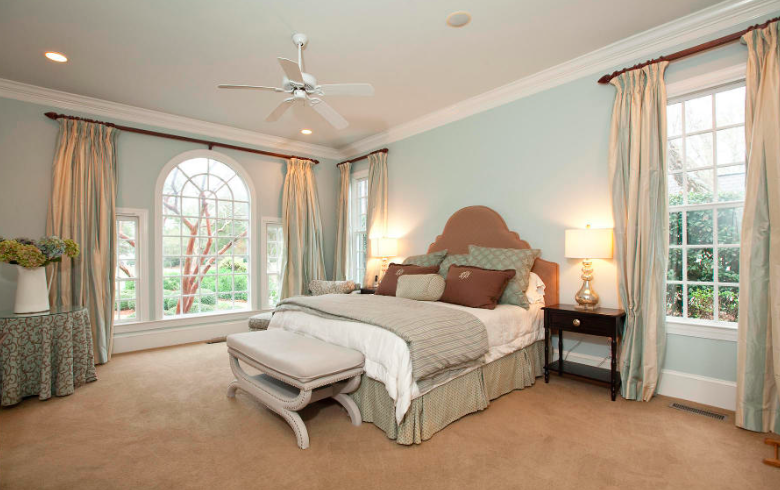 The master suite offers two master closets and a large bright bath. Just outside the master is an additional room that is perfect for a second office, workout room, or a nursery. Upstairs you will find 3 bedrooms and 2 full baths along with a with a large bonus room for even more flexible space that can be accessed by a separate staircase. This home has tremendous storage throughout. The back patio is a covered retreat. Enjoy the covered back patio for entertaining or relaxing with a great book. The ample yard is perfect for a growing family, pool or garden. 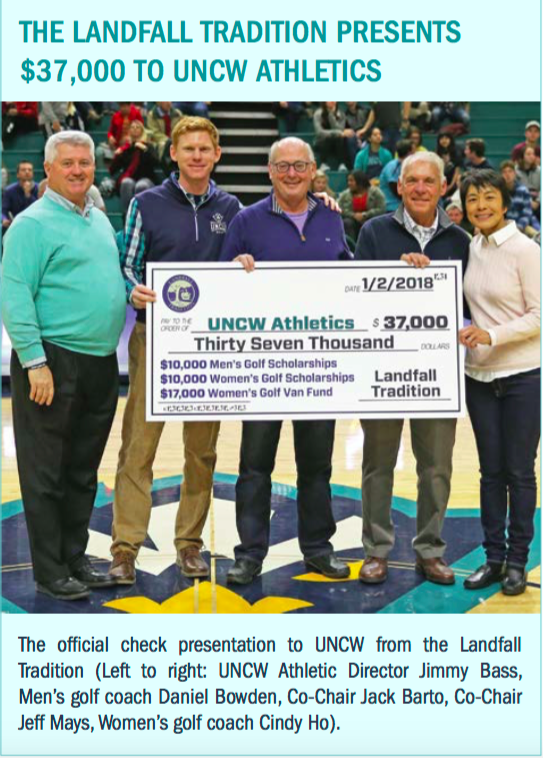 The Landfall Tradition was proud to present $37,000 to UNCW Athletics. $10,000 was given to Men’s Golf scholarships, $10,000 allotted to Women’s Golf scholarships, and $17,000 went to the Women’s Golf Van Fund. The Landfall Tradition is an annual collegiate women’s gold tournament hosted by the Country Club of Landfall. During the tournament eighteen teams compete for first place. Congratulations to this past year’s winner, Duke University. This is a Builder’s Masterpiece by Mark Johnson Custom Homes designed for convenient, energy efficient and connected living. The first level plan features a cozy private study with barn doors, three spacious bedrooms with ensuite baths, plus a pool bath. Twelve to fourteen foot interior ceilings throughout on first floor accentuate the open spacious living space. The upstairs has an additional two bedrooms, which share a bathroom. This home has a two car garage with convenient extra space for a golf cart or storage. This large five bedroom house has substation space, and is ideal for entertaining. Currently under construction this home is due to be completed in July 2018. Enjoy a romantic Valentine’s Day dinner at the Country Club of Landfall this year! With a spectacular menu this is an evening to be remembered. The dinner will take place in the VDR and Grill Room at the Nicklaus Clubhouse. The prix fixe menu includes fried oysters and bacon, contemporary caesar salad, filet mignon and scallop, grouper chowder, bone-in pork chop, and for dessert valrhona chocolate and hazelnut cake, vanilla bean pearls, passion fruit coulis, and candied hazelnuts. The Wilmington International Airport (ILM) has expanded! Now with flights to more cities, ILM makes its easier than ever to travel. Starting in March flights to Chicago and Dulles International Airport outside of Washington D.C. will be added. 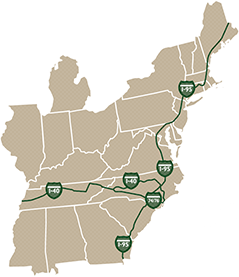 These flights are part of the expansion to the airport in an effort to accelerate growth. In 2017, 57,000 aircraft departed or arrived at ILM, transporting 836,000 passengers. In the near future ILM hopes to add nonstop flights to Newark and Boston as well.